I’m so excited to share this super fun patriotic punch with you today– perfect for your backyard holiday barbecues or pool parties this summer!! As part of a campaign with Hershey, I was sent some Twizzlers candy to get creative with! 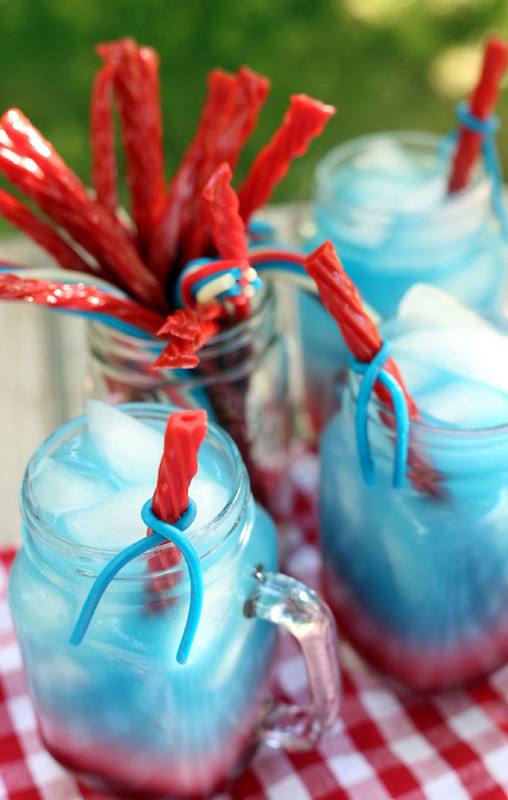 As a kid, I remember how fun we thought it was to use Twizzlers Twists as edible straws! 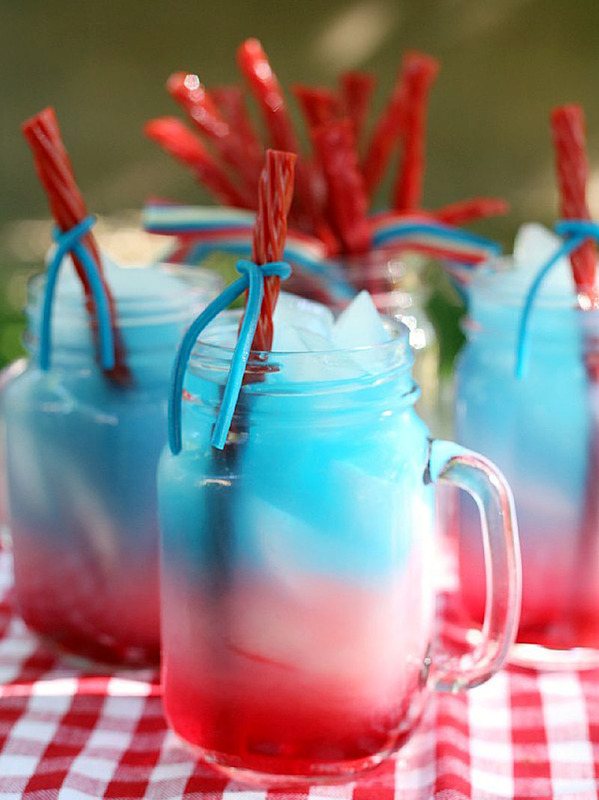 So, I decided they’d look great as a fun “twist” in some red, white, and blue drinks! This patriotic punch would be be perfect for your Memorial Day or 4th of July events! To make some fun patriotic punch, you’ll need 3 different kid-friendly juices/drinks in red, white, and blue. Really, you can use ANY red, white, and blue drinks that you think will taste okay together. The catch is that all three need different sugar contents per ounce. And, the larger the sugar content difference, the better your drink will layer. That’s because this involves a little kitchen science–density to be exact. So, you’ll need to read your labels and do a little math for this recipe! In this case, I used a cran-cherry juice (red), a kid-friendly piña colada drink (white), and a blue raspberry drink (blue). You can see that our red & white mixed just a bit (their sugar contents only differed by 3g). But, it actually did look more white in real life than the picture shows! Start by filling the glass about 1/4-1/3 of the way up with the drink with the highest sugar content per serving (red in this case). Then, fill the cup FULL with ice. Pour the drink with the next highest sugar content (white in this case) very slowly over the ice. You’ll use the ice as a sort of buffer – pouring directly on to the ice with a very slow pour (small amount). If you just pour a whole bunch in quickly, the colors will combine. Snip the ends off of a Twizzlers candy and place in the drink for a straw. 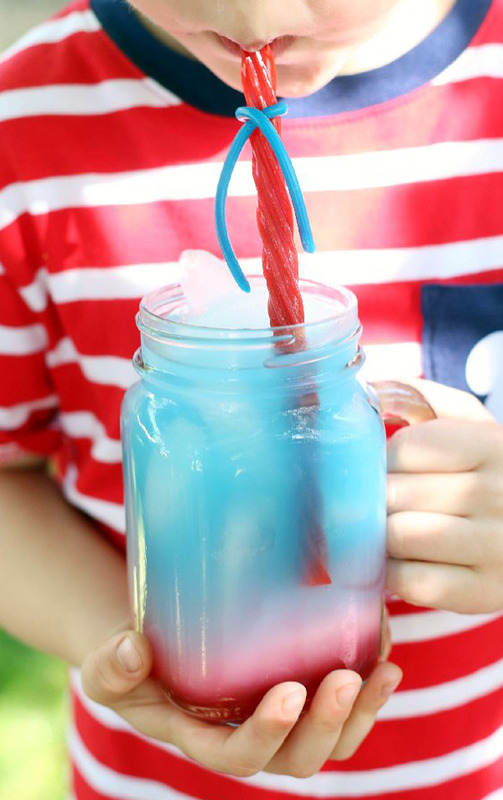 For some added fun, you could take some of the red, white, and blue Twizzlers PULL ‘N’ PEEL candy to add a little edible bow or tie to your straw. Needless to say, the boys think this might be the best drink ever!! They could hardly wait to sample and were so excited to discover that they could drink through their Twizzlers Twists!! There’s really SO much #TwizzlersSummerFun that can be had with these sweet treats! This candy is a summer road trip favorite, but you can see that there are all kinds of ways to get creative with it.